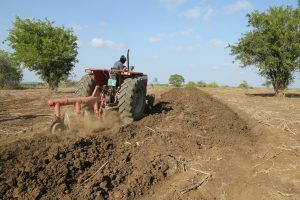 Even with the general perception that Mombasa is predominantly a County of tourism and maritime businesses, the agricultural sector comes in handy as an important cog in the socioeconomic development wheel. The County Executive Committee Member for Agriculture, Livestock, Fisheries and Cooperatives Mr. Hassan Mwamtoa says the focus of the department is to encourage value addition in all the sectors’ value chains. This, he said would ensure that the residents involved in this sector earn more for their produce instead of falling prey to middlemen. “As an incentive to farmers, we have availed high breed maize seeds as well as high value vegetable seeds. We have also mechanized agriculture with over 300nacres of arable land being ploughed ready for planting. “Our plan is to increase acreage under agriculture to up to 2,000 acres next year,’ he said. Mr Mwamtoa noted that similar initiatives have been put in place for fisheries with plans to establish a common user storage facility, fish auction market and processing plants to improve earnings of the local fishermen. Mombasa County Government affirms the key role that agriculture plays and has come up with deliberate and concrete steps to harness the potential both to enhance food security and to create wealth through agribusiness. Coming from a backdrop of food shortfall region, the County recognises that every effort is needed to improve the situation. The Coastal region, in general has an area of 83,530 Km square and a population of 3,325,307. It requires up to 4million bags of cereals to feed herself. Sadly, though, the region produces a paltry 0.8million bags. It is also gratifying to note that even with this massive deficit, the potential is enormous and calls for strategic planning to harness it. The Coastline, for instance, stretches from Vanga in the South Coast to Kiunga in the north Coast with access to 200 nautical miles of the Exclusive Economic Zone (EEZ) with corresponding potential for fisheries resources. The department, however, is not just about crops and livestock but comes with it the lucrative fisheries sub sector as well as cooperatives which is the driver for resource mobilization, saving and investment. Ms Rosina Wasoi, County Chief Officer for Agriculture, Livestock and Cooperatives says the department has unveiled a robust subsidy programme where farmers are given certified seeds and other farm inputs as a motivation to take up serious farming. One of the steps taken towards mechanization of agriculture is the acquisition of a tractor that farmers can easily access at very affordable rate and plans are underway to add two more tractors to boost crop production. With focus shifting towards cash crops and value addition, the County is promoting the growing of high value traditional crops such as amaranth, sweet potatoes, cassava and trying to completely remove the maize mentality. “On the livestock sub sector, poultry keeping especially the kienyeji species is gaining momentum with some farmers forming an association to enable them sell to meet the demand which is currently being satisfied by chicken coming all the way from Ukambani. “Very soon we will start providing incubators as an incentive to farmers to help them have easy access to chicks,’ she adds. To firm up marketing of the produce and products, Ms Wasoi says they have introduced a cottage industry system where farmers and especially women groups are taught tenets of value addition and use available foodstuff such as peanuts, amaranth to make butter and cakes that fetch more money in the market. Still, she says most of the arable land is not being utilized but the County has embarked on a campaign to promote agriculture to have more land put to use. Mwakirunge is one of the areas that the government is laying special emphasis because it has vast agricultural land. One of the major challenges that the County Government has identified is lack of capital or seed fund that would enable the people to fully exploit this potential. Resource mobilisation therefore comes in as the first priority that the government is following up. We have seen the strides that the cooperative movement has made in providing capital as well as pooling resources, inculcating the culture of saving and investment as a basis for wealth creation. To achieve this, the department is forming cooperative societies to mobilise domestic savings and provide a framework for agricultural production and fisheries. Through this movement, farmers have been able to embrace marketing and value addition, key components in wealth creation, employment and food security. The County Government has invested in research and training to help boost agricultural production. As a County Government, the department has continued to address these constraints some of which were occasioned by poor planning prior to devolution. With a booming tourism industry, the region’s internal market is therefore huge. The emphasis lays on Infrastructure to support agribusiness, need based planning, participatory decision making, and access to credit, technology adoption, marketing, extension services and strategic infrastructure development. “We want to boost extension services up to the ward level by providing the requisite facilities like vehicles and start serious farming education through farmers field days, setting up demonstration plots and damming to provide water for irrigation in Mwakirunge,” she adds. In any place where people keep animals or livestock, it is expected that there will be diseases that if not treated or controlled could have serious adverse effects on the welfare of the animals. For this reason, Mombasa County has in place a fully-fledged veterinary department to look into animal health through control and treatment of diseases. Acting County Director of Veterinary Services DrMusembiKioko reveals that all the major livestock in Kenya, both exotic and local, are found in Mombasa. 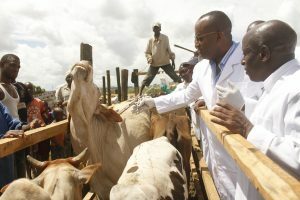 DrKioko says the County Government has an elaborate vaccination programmeto control outbreak of livestock diseases such as foot and mouth, new castle and many other diseases that could break out. The fisheries department covers three main priority areas in helping fishermen to harness the huge potential in the area. Sustainable fisheries to ensure a steady supply and at the same time conforming to proper and acceptable practices like use of appropriate fishing gear. Fishermen lack capacity and therefore forced to concentrate near the shores instead of fishing in the deep sea. County Chief Officer for Fisheries Mr UzelMzera reveals County’s elaborate plan to manage the industry with stakeholders such the Beach Management Units (BMU). Mombasa has 15 BMUs which drive the industry with the support from the department of fisheries. “We have a detailed programme that is captured in the County Integrated Development Plan (CIDP) that includes a subsidy plan to provide fishermen with fishing gear. This is done through the BMUs. “Proper fishing gear does not only ensure better catch but also responsible fishing without destroying the marine environment for which the breeding of fish depends,” Mr Mzera notes. A landmark project that the County government has successfully accomplished with remarkable success is the construction of the MV Mombasa fishing boat for deep sea fishing which enables fishermen to venture in waters beyond the one nautical mile. Mr Mzera says the County has, in its strategic plan to buy deep sea fishing boats to enable local fishermen venture and fully exploit the exclusive economic zone. The plan, according to the officer, is to have every BMU have two boats. The department is now working on a comprehensive marketing plan to be driven by a strong cooperative movement to deal with value addition and proper handling of fish to avoid post-harvest losses. In recognising the potential for aquaculture, the County Government has also provided fish ponds and trained youths in all the six sub counties of Nyali, Kisauni, Mvita, Jomvu, Likoni and Changamwe. The main challenges in the sector include inadequate cold storage facilities at landing beaches/sites, underdeveloped aquaculture and insufficient credit facilities for fishermen. Future plans include putting up fish processing facilities complete with packaging and cold storage facilities. “We also want to undertake continuous capacity building to impart fishing skills. 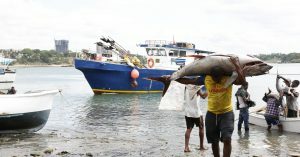 “Through the CIDP the department has captured the establishment of a fish port, an important facility that will ensure that up to 30% of the fish landing done in Kenya,” he said. Other plans include the rehabilitation of landing sites but more critical is to get the title deeds to safeguard the sites from grabbing and encroachment.